Sloan - February 9th 2019, peacefully at The Causeway Hospital, Robert, 6 Carnduff Park, Ballycastle, dearly beloved son of the late Adam and Sadie, much loved brother of Elizabeth, Annie, Ellen, Colleen, Margaret and the late Jim, and a very dear uncle and great-uncle. Funeral from his home on Wednesday at 1.30pm to Ramoan Parish Church for Service at 2.00pm, burial afterwards in the adjoining churchyard. 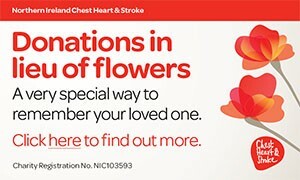 Donations in lieu of flowers, if desired, to Chest, Heart & Stroke, c/o DJM Robinson & Son, 121 Culcrum Rd., Cloughmills. BT44 9DT. I am sorry to tell you that Robert SLOAN has passed away.